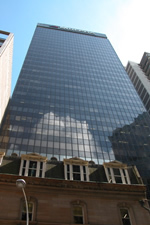 A 30 storey commercial building. Air Handling systems located on every floor with central cooling and heating plant. Existing Building Management System providing daily time scheduling and user programmed over-rides. After hours requests were received via fax or telephone and programmed manually into the BMS by the building superintendent. AHAC programming was only available during the superintendent’s normal working hours (07:00 to 15:30, Monday to Friday). Outside of these hours it was not possible to request AHAC. As well as manual activation of the AHAC system, logging of usage and billing was also a manual process. Billing errors and disputes over usage were common. The supply and installation of all the required hardware and interfacing to the existing plant. Creation of building database and addition of tenant administrators. Comprehensive, 24 hour, 7 day support for all AURA installed equipment. Building Manager access to all billing and administrative features. An ‘AURA’ controller was installed in an existing switchboard in a central location. New interfacing cabling was installed between the controller and the mechanical switchboards and interposing relays were installed to activate the existing AHU fan contactors. A signal was supplied to the BMS to enable the cooling and heating plant as required. The controller was installed in parallel to the existing BMS after hours system to allow for a smooth transition to ‘AURA’ and eventual total redundancy of the existing after hours system. Each tenant supplied AURA with the details of an employee who was to be the system administrator for their company. Once issued with a username and password, the administrators were then able to add, modify or delete users of the system at their convenience. Both Tenant Administrators and Users are able to add AHAC schedules to the AURA system. The property manager was supplied with an “Administrator” password that allows control over all aspects of the AHAC system from any location with internet access. New tenants can be added to the system in minutes or existing tenants details can be modified or deleted as required. Usage and billing information is available either as raw data, a profoma invoice or as a text file that can be saved and imported directly into a spreadsheet or accounting package. Tenants now control and administer their own usage of AHAC. AHAC scheduling and operation is now available to tenants 24 hours a day, seven days a week. All programmed schedules are forwarded to the tenant administrator by email. The tenant administrator has the ability to delete any schedules within the tenancy before activation. Usage costs can be easily allocated to departments or cost centres as required. Data exported complies with NABERS. Overall, the implementation AURA has streamlined the administration process and fixed the costs of providing AHAC for the building. The building superintendent is no longer involved in the activation or administration of AHAC and is free to complete their core duties. Usage disputes have disappeared as schedules are set by the tenants and each entry is logged with a date, time, duration and username. The building manager is able to create Tax Invoices directly from data exported from the AURA web site. AHAC service is provided at a fixed cost, that includes all maintenance and software/hardware upgrades for the term of the contract.